We finally made it! 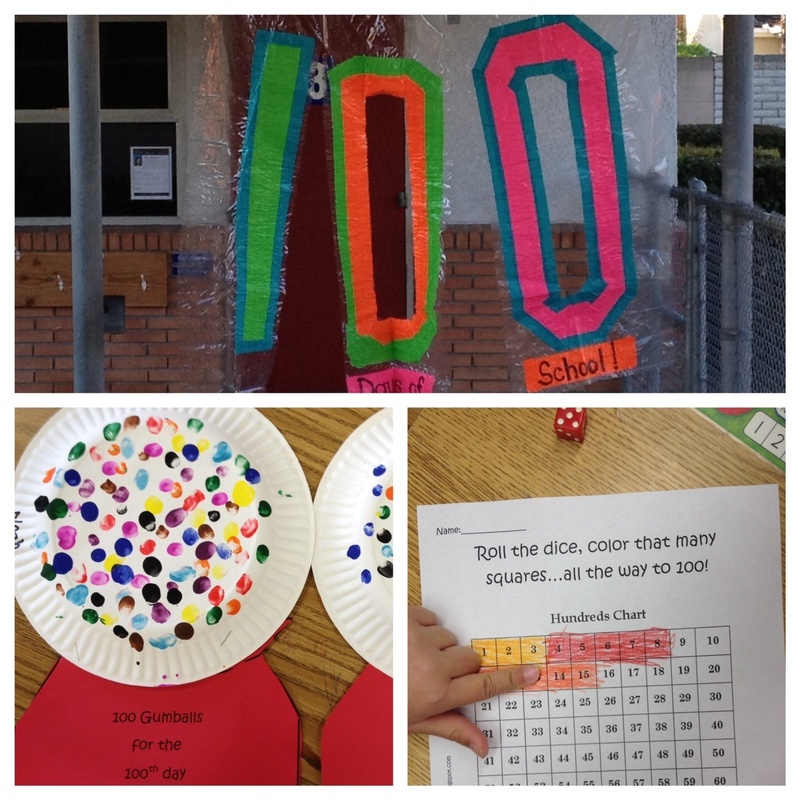 Yesterday was our 100th day of school! I feel like everyone else had their 100th day of kindergarten WAY sooner than we did.... I must have gotten a longer summer :)... 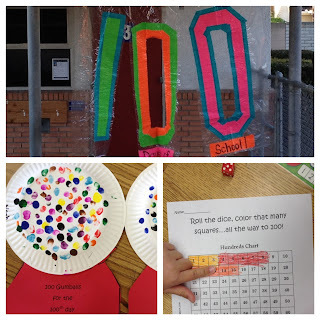 Here are some of the fun projects that we did to celebrate 100 days. Up until now we have been focusing on counting by ones and 10's. Pretty soon we will move to counting by 2's and 5's. To start our day, the students walked through the 100th day of school banner, created by my fellow teacher, Cathy. She made this out of shower curtain and duct tape. The kids loved walking through this all day! After our morning routine, and counting to 100, we played a game in partners to roll the dice to 100. Each pair was given a dice and their own worksheet. The players took turns rolling the dice. Whatever number they rolled, that is how many squares they both colored. They worked as a team to roll to 100! For our second activity, we made gumball machines, out of paper plates. I have seen this on Pinterest and there are so many different ways to do this. Instead of cutting out TONS of circles for them to glue down, I decided to have them dip their finger in paint, and "stamp" 10 circles with 10 different colors of paint, which gave us 100 gumballs! I had each student take their plate and start at the beginning of the table and dip their finger in the first color and make 10 dots. Then they would slide their plate to the next color and repeat until they had all 10 colors. This "assembly line" technique worked perfectly! After our gumballs dried, I had them cut out the base of their gumball machine that had the phrase "100 gum balls for the 100th day of school"
Another project that we worked on was a poster that my friend, Cherie, gave our class as a gift. She bought this adorable poster at Lakeshore, where the students answered all different questions about the 100th day of school. Here is another worksheet we did, where the students wrote the numbers counting by 10's. I love the shower curtain!!!! That shower curtain is cute! I like the gumballs too. Where did you find the gumball worksheet that counts by tens? !